Take what you love from the music of Glenn Hansard, Kings of Convenience, and Johnny Cash, roll them into one guy’s sincere songwriting and you’ve got Crooked Fingers‘ Breaks in the Armor. The songwriting is filled with solemnity, but not to the point of misery and the music is filled with passion, but not to the point of zeal. The way Eric Bachmann, the man behind Crooked Fingers, sings his 11 tracks expose in an obvious manner that these songs really matter to him. Not that his past music didn’t matter, but if we take a trip down discography lane for a moment we learn that Eric Bachmann has dabbled in and out of music in the last two decades. He was one of four members of Archers of Loaf with whom he released four albums in the ’90s, then he started Crooked Fingers as whom he recorded a slew of LPs and EPs, then he took a break to do a self-released solo album, then he quit music altogether to teach English in Taipei, and then he quit teaching altogether to go back to music. With this last career swap, there’s no doubt that music has new value to Bachmann. On “The Hatchet” he sings, “I’m leaving my friend, it’s hitting me now. If I loved you before, I could love you again.” Certainly, listening to Bachmann’s latests songs like “Went to the City” or “Typhoon” from his sixth full length as Crooked Fingers, we can listen assured that Bachmann loves music again. 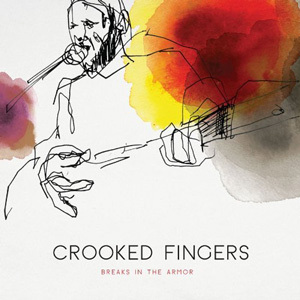 Crooked Fingers – Breaks in the Armor (Album Trailer) from Merge Records on Vimeo.